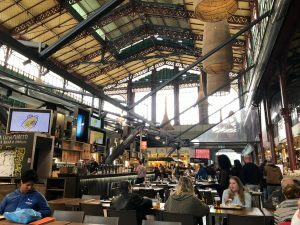 Mercato Centrale: Mercato Centrale is a two-story market that brings together all of the magic of Florence. The first floor is a traditional market with different vendors selling everything from fresh fish to olive oil – this is a great place to buy gifts to take home for family! The top floor is a food court with all different traditional Italian foods. You can also find the best cannolis in Florence on the top floor of the market. They are made to order and absolutely delicious. 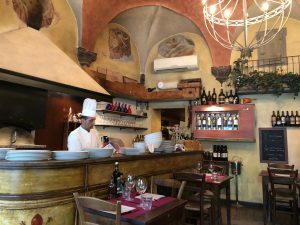 Ristorante Boccanegra: Located close to Santa Croce, but off the main road, Ristorante Boccanegra features some of the best food in Italy. Grab a glass of the house wine and some a fresh sourdough pizza and you’ll have one of the best meals in Florence! Make sure to have a reservation or come very early because by 8:00 pm the place is full. 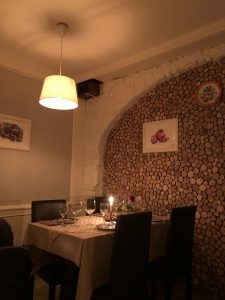 Ristorante Hostaria Il Desco: Il Desco is a hidden gem off of Santa Trinita Bridge. The restaurant is small and lit by candlelight which creates a cozy, family-friendly vibe. The staff is friendly and welcoming to locals and tourists alike. Like Osteria di Santo Spirito, this is a great place to come for traditional and delicious Italian food. 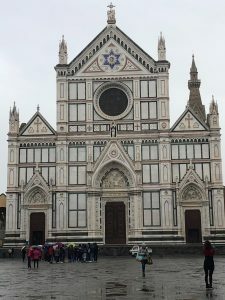 Santa Croce: The number one place to take your family should be Santa Croce. While smaller than the Duomo, and maybe less known, Santa Croce is one of the most important cathedrals in Florence. From beautiful stained glass to awe-inspiring monuments dedicated to Dante and other famous Italians, Santa Croce has countless things to see. In addition, some of the most famous Italians, such as Michelangelo and Galileo, are buried here. The church was partially damaged in the flood a few years ago and the art that is featured there is so important that Italians swam into the flooded river to save the art. Leather Markets: The leather markets aren’t for people easily overwhelmed, but for those willing to deal with a little chaos, the leather markets are a must-see. The roads surrounding Mercato Centrale are lined with hundreds of street vendors selling leather goods. This is a great place to take family if they were hoping to grab an Italian leather purse as a souvenir or if anyone in your party likes to bargain! However, don’t forget to ask the vendor to hold a flame to the leather to make sure that it’s real (real leather doesn’t burn!). Noelle is a fall 2018 SAI Florence student from Belmont University.